What does it take to empathetically understand, to make a part of oneself, to grok an ACE score? The historical ACE lifespan continuum on the left began at conception. The pyramid on the right promoted a limited view of ACE that assigned childhood as the pyramid’s base. 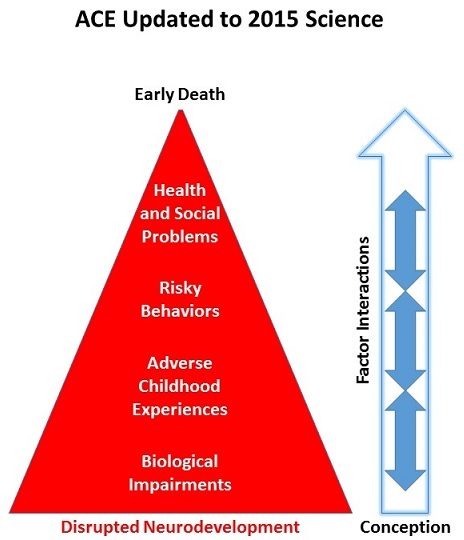 The official ACE pyramid doesn’t accurately reflect current science documented in, for example, Epigenetic effects of early life stress exposure. By downplaying Disrupted Neurodevelopment that may begin at conception, governing agencies implicitly endorse approaches that fail to address prenatal causes for later-life adverse effects. Were your parents were too drunk or high to take care of you or take you to the doctor? Was your mother often or very often pushed, grabbed, slapped, or had something thrown at her? Don’t unassistedly disappear over time. Research on how these adaptations consistently influence our later-life ideas, biology, and behavior. The above recommendations for research are neither the current focus of ACE research nor the direction of related efforts to assist affected individuals. Relevant studies that I’ve curated on this blog often only produced symptomatic evidence. If a study couched its findings in non-etiologic phrases such as “is associated with” or “is linked to” or “may relate to,” it didn’t address ACE originating causes. “New and more effective prevention programs” seldom address Disrupted Neurodevelopment and Biological Impairments with efforts to reduce the source of the damage. At best, they only alleviate the symptoms. If a program’s presentation showed multivariate analyses with ACE score probabilities and percentages, it didn’t address originating causes. Here’s a YouTube search of ACE + adverse. Evaluate the current focus of ACE efforts by people employed in the social sciences and services. What did you notice? How many presentations emphasized prenatal Disrupted Neurodevelopment, a period during which problems may be prevented by addressing causes? Did you instead see that these were outnumbered by many more presentations that emphasized Health and Social Problems symptom interventions? So, what does it take to empathetically understand, to make a part of oneself, to grok a person’s ACE score? If a study didn’t measure feelings, then its findings may not pertain to genuine empathy. People who are helped may not recognize it at first, but over time, they’ll sense whether the helper’s empathy is genuine. Regarding understanding – I feel that people first need to ameliorate the origins of their own problems. Then they may be able to help others therapeutically address causes for ACE symptoms. Did you feel they could empathetically understand others? Wasn’t the welfare of the people who may have been helped truly incidental and secondary to someone who was acting out their own problems?